Anna Kendrick and Blake Lively make for an unlikely pair in director Paul Feig’s schizophrenic comic-thriller A Simple Favor. (It’s a bad title, one that is infinitely confusable with A Simple Plan and A Simple Wish. Apologies in advance if I accidentally refer to one of those in this review.) The movie is based on a novel by Darcy Bell, and was adapted by Jessica Sharzer (who’s perhaps best known for writing several episodes of American Horror Story). 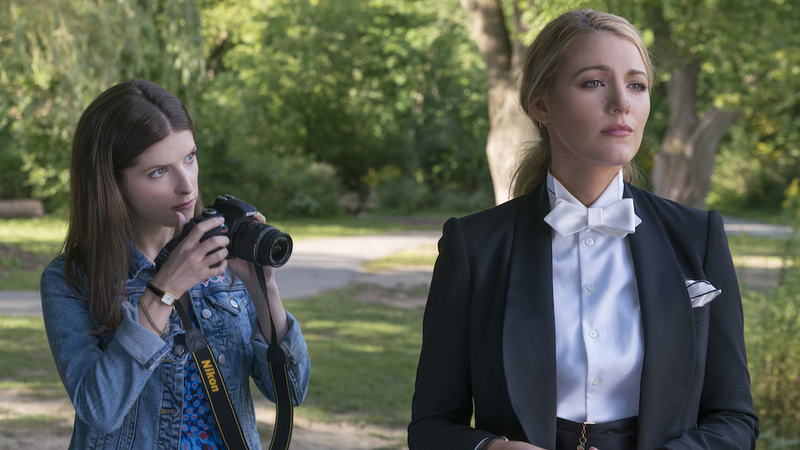 At its best, A Simple Favor enters a kind of Kathleen Turner-in-Serial Mom territory (although Feig doesn’t always have the nerve of a John Waters): one in which the world of “normal” suburban people is infinitely more disturbing than it appears to be. Kendrick plays Stephanie Smothers, an aggressively cheerful housewife without a husband: if she were a Stepford wife, the men’s association would deprogram her. Stephanie’s primary outlet (aside from over-volunteering at her kid’s school) is a domestic-themed vlog, and the movie opens with an entry from that vlog, in which Stephanie updates her viewers on her new best friend Emily (Lively), who’s mysteriously vanished. Then the movie takes us back a few weeks, to when Stephanie and Emily first meet. (Their sons are in the same kindergarten class.) What unfolds is a kind of comic reworking of Gone Girl, seen through the eyes of a bewildered best friend. Anna Kendrick is nothing if not game. And there isn’t another actress who could play this character better. Kendrick first registered as the mousy, most-likely-to-sit-at-the- front-of-the-classroom type in Up in the Air (the 2009 George Clooney vehicle). In A Simple Favor, it’s as though Kendrick is making fun of that initial image of the perky, hyper, straight-A-student. But comedies like Pitch Perfect have allowed Kendrick to loosen up, and shown us that she possesses many layers as an actress. She’s a remarkably hard working actress, and you can feel that in A Simple Favor. But the reason Kendrick’s performance works is because of Blake Lively. They complement each other perfectly. Blake Lively is a tall, roving Venus flytrap of a woman, and as Emily, she rocks a men’s pinstriped suit like Diane Keaton at the Oscars. Emily works in New York, in the fashion industry, but because of her writer-husband’s academic career, has been exiled to the suburbs of Connecticut. She derives much pleasure from the fact that Sean, her husband (the dashing Henry Golding, of Crazy Rich Asians), is a fledgling author who, after one successful novel a decade ago, hasn’t written a thing. Emily teaches Stephanie how to stop apologizing all the time, how to push back against pushy men, and how to make the perfect martini (the key is in the frozen gin). But despite its problems, A Simple Favor shows us a good time, because it’s just so weird. Clearly, Emily is insane: she breaks far too many gender rules not to be. This is the most interesting part of the film: the idea that women who don’t fit certain molds must be crazy. But the movie loses sight of this idea in the end. As a director, Paul Feig often gets trapped into the conventions of genre. Bridesmaids (a movie I really enjoy) goes on far too long because it’s trying to hit certain beats of the romantic comedy. Ghostbusters forgets it’s a comedy, and turns into a Marvel movie, replete with overlong fight scenes full of explosions and inane dialogue. But because of Anna Kendrick and Blake Lively, A Simple Favor redeems itself somewhat. The conversations between these two women feel urgent and dangerous (in a good way). The film itself resembles Stephanie: it’s both troubled and turned on by its darker urges, which may be the reason Emily is finally suppressed. She’s the kind of Id-centric character that makes dark comedies so fascinating. Don’t lock her up: let her out.